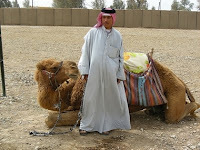 Michael Yon has been reporting the good news from Al Anbar Province this week. Even liberal TIME magazine is reporting the security progress in Iraq. Al-Anbar province is beginnning to see economic progress as the security situation continues to improve. U.S. Marine Corps Brig. Gen. John Allen, deputy commander of Multi-National Division-West, and Mamoun Sami Rashid Al-Awani, the governor of Al-Anbar province, discussed the progression of security and stability in Al-Anbar province at the Combined Press Information Center in Baghdad Tuesday. U.S. Army photo by Spc. Carl N. Hudson, Combined Press Information Center.BAGHDAD — The deputy commander of Multi-National Force-West and the governor of Al-Anbar province held a press conference at the Combined Press Information Center Tuesday. U.S.Marine Corps Brig. Gen. John Allen, deputy commander of MNF-W, and Mamoun Sami Rashid Al-Awani, the governor of Al-Anbar province, discussed the progression of security and stability in Al-Anbar province. Recently, Al-Anbar citizens have made several big steps engaging al-Qaeda in the province and have grown politically and economically closer with the Iraqi central government. “There are dramatic changes in Al-Anbar,” said Allen. “The Anbaris have rejected al-Qaeda’s. “The security improvements have been brought about by a groundswell of opposition to al-Qaeda, represented in the fact that just in a year, the police forces in Al-Anbar have grown from about 2,000 to 14,500,” he added. As tribal and elder leaders in Al-Anbar province offer their sons to combat terrorism through the Iraqi Army or Iraqi Police, Coalition forces are optimistic about the overall situation in the province. As efforts in security progress, the economy in Al-Anbar province is expected to pick up. While the Al-Anbar province has improved economically and in security, al-Qaeda continues to attack Iraqi and Coalition forces. “There are still some security issues, and there will be spectacular attacks by al-Qaeda to gain headlines and to grab attention,” said Allen. With the arrival of more Coalition troops to support Al-Anbar in pursuing al-Qaeda, the Al-Anbar provincial government is expected to focus more on reconstruction and ultimately returning to normalcy. According to U.S. Army Maj. Gen. William B. Caldwell IV, the Multi-National Force-Iraq spokesman, the Coalition wins the war only when the Iraqis achieve peace. While Coalition leaders expect peace in Iraq to be lengthy and difficult, Multi-National Force-Iraq remains committed to the goal of self-governance, economic prosperity and security of the population for the Iraqis. In two of the four restive provinces in Iraq we read about tremendous positive steps towards security improvement. Both of these provinces have been the sources of most of the Baathists who brutalized Iraq. These provinces are also predominantly Sunni Arab. After we freed Iraq from the Batthists, the provinces found them selves out of power, in the minority and in fear of retaliation for their brutality. Now reading about these same Iraqis from Anbar province entering the ISF (Iraqi security forces) in large numbers, is a very hopeful sign. Locals rejecting Alqaida and fighting them is diminishing the recruiting base for the terrorist. Recently the percentage of terrorists arrested and killed who are non Iraqis is hovering around 60%-70%. Progress is very evident in the most difficult parts of Iraq. Not only are the locals fighting terrorists, joining the ISF and increasing participation in the government of reconciliation, the Iraqi security forces are increasing in numbers and capabilities to eventually take over security responsibilities for their own country. To read more about what our brave men and women are achieving in Iraq visit http://www.mnf-iraq.com/. Security Forces also nabbed 20 Al Qaeda members last night in a raid.